I have been a father for 38 years. I have three children. I remember my entire journey of fatherhood from the very beginning. It started off as something effortless. I got my wife pregnant which was not difficult at all. It was so wonderful we decided to she should get pregnant two more times. It was when she delivered our first baby that fatherhood stopped being something abstract and became real. Erica was a colicky baby who was allergic to almost all types of milk. But she was a sprightly kid, super active, who walked very early. She seemed to be ahead of the curve. She also ran and talked in quick succession — a fast learner in every way. Our second child, Ala, was more relaxed and easygoing, a direct contrast to Erica. She was quiet, unrushed. She fantasized about being a princess and internalized it so that it showed in the way she walked and handled herself as a very young kid. She was sensitive to music and would cry when the chords and melody of something she was listening to turned sad. Early on, it was clear she would be an artist. Mio, our only boy, was born smiling and had a loud chuckle even as an infant. He was curious about everything and was the most easy-going of our three kids. I’ve always enjoyed our father-son relationship. We seem to be on the same wavelength. I learned fatherhood skills when they were needed. I helped Lydia put them to sleep. I spent a lot of time reading to them and with them, the classic children’s stories like “Peter Pan,” “Little Red Riding Hood,” “Jack and the Beanstalk,” etc. I also read poems to them and played music at bedtime. When they started going to school, I helped them with their homework. I got them into reading, and made sure they loved the written word so they would become readers for life, which they are. And all of them write as well. Erica is four years older than Ala. And Ala is five years older than Mio. For a time, I had a child in college, high school and grade school. I had to relate to each of them uniquely as they went through the different stages of learning, socializing and self-discovery. Fatherhood is demanding. Aside from physically protecting, nurturing, educating and taking care of them, I have to be some kind of authority on intellectual, emotional, physical and spiritual matters. I am also a disciplinarian, playmate, storyteller, protector, coach, rescuer, friend, someone who can make them laugh, think, and more. I must also earn their respect. And whatever the occasion, I have to be fully present and relevant. When they were growing up, I liked to provoke them to think and discover things for themselves, experience being the greatest teacher. I gave them ample opportunities to figure things out for themselves. As they have grown older, I find that many of my traditional roles as father have begun to recede and disappear. Kids grow up and become young adults. They have new sets of problems that require me to step back in spite of my protective instincts towards them. I must learn to listen and allow them the freedom to experience life on their own. I must refrain from imposing on them too much. I must learn to trust them and let go, but still be around to lend advice and empathy when they ask for it or need it. I am quite pleased that my children feel free to open up to me not just about their careers, or their emotional turmoil, but also about their love lives. We speak very frankly since they know I will really listen and, at that moment, suspend judgment when they tell me their problems. I have had many long, satisfying talks with my three kids. What I enjoy most these days is the constant affirmation that Lydia and I have raised interesting, intelligent and compassionate human beings who have something positive to contribute to the world. Erica, Ala and Mio know how to love deeply. They are kind and forgiving. They are passionate and independent. They are mostly happy and have a strong sense and appreciation of being part of the family we find ourselves in. Our kids have had opportunities to travel together, caring and looking after each other. It is a blessing that they genuinely enjoy each other’s company. While they are all on their own in different parts of the world, they work at being together as often as they can. It is said that a parent’s work is never done. I am not sure about that. To a certain extent, many of the roles I played when they were growing up have ended. Lydia and I raised our kids to be free and independent. I like to think that they will eventually outgrow us, come into their own, and live their own lives. But our presence in their lives continues. I hope we continue to be relevant to them as we all get older. I like it that they chose their own paths in life. Independence does not mean they will forget us. It just means they can be brave enough to pursue their dreams knowing that they have our support. Fatherhood has taught me many things, the most important of which is unconditional love. As parents, we may sometimes feel that our kids have failed us when they do not live up to our expectations. But we still love them even as we pick up after some bad decisions they may make. I hope they can also forgive our failures and imperfections as parents. Raising my kids has taught me patience, consistency, discipline, love and compassion. For this, I am grateful to them. By the way, my kids have made me a grandfather of two — which is an entirely different experience altogether. But that’s a subject for another article. In the big, loud world of men, there is chaos. The air is full of anger and hatred. People are shouting, arguing, insulting and killing each other. In more and more random places, innocent men, women and children die not through their own making but because of the hatred of some people for others. Headlines scream tragedy, ignorance, suffering, discrimination, and loathing. Media thrives on all this. Social media, meanwhile, is becoming ground zero for the deadly epidemic called fake news. At no other time in the history of the big, loud world of men has there been so much confusion. With internet and modern technology, we can easily verify truth, yet many do not. People are so misguided and are easily lured by lies and fakery. Many have become incapable of thinking, much less analyzing. This is the state of the world of men right now. It is a tragic world of hate and tears, of victims and victimizers. As I write this, I am looking out of my window. It is a cold winter day. It is also raining. The flowers stand steadfast amid the slight rainfall. If I stare at them long enough, I swear they like it. Their vivid colors bring a smile to my face. The rain is not inflicting violence upon them. It is more like gentle stroking, caressing and bestowing a nourishing wet kiss. The grass grows slowly in wintertime, like it is in hibernation mode. It looks like it would rather slow down its growth and just watch the flowers and enjoy the rain. The birds are hiding under anything that will keep them dry. They are in constant conversation. Sometimes, there are only two of them chirping but soon enough, others join in. They make such pretty, lively sounds, like that of friends who enjoy each other’s company. Some birds brave the rain and fly to another spot, perhaps to be with other friends. They seem to have so much to talk about every day, under any kind of weather. But this time, they are waiting out the rain together before flying out to look for food. The trees murmur ever so softly; you almost can’t hear it. A leaf just fell right now. I wonder what drama is going on here. Does the solitary leaf hurt because it must leave the tree and the other leaves? Only a poet can answer that. In this quiet world of men, everyone listens to everything. And there is a lot going on. The conversation is between the universe, all of its inhabitants and the few silent men present. Yes, everything is alive. Everyone is a sentient being. Everyone is talking to everyone. It has always been like this since time began. The loud men are the least who can hear and understand what is going on in this silent world. Look around you. Every little detail in the Universe seems to know its place. Buds will bloom as expected. Birds must fly. Trees and plants must grow. The weather is as it is. It is sure of itself and what it is tasked to do. Time passes on, so sure of itself, it has decreed that you can’t go back to the past to fix or change anything. It is ever fresh and new, and is the only thing we know that is untainted. Every now is a new beginning. Every moment is potentially redemptive. Meanwhile, in the big, loud world of men, the great majority have forgotten that the silent world also exists. Lost in the din of their shouting, they cannot recall that such a refuge was even present. In fact it has always been eternally there. Such is the tragedy of the big, loud world of men. They know not what they have, and what they are really capable of experiencing and understanding. They live in a trance, locked in the world of power, wealth, fame, gain, superiority, control, greed, avarice, lust, and the obsession to dominate everything. But the world was meant to have so much diversity, and human consciousness must wake up to this. I am talking about diversity in race, opinions, beliefs, religion, lifestyles, and wisdom. This is why there is this need to rediscover the world of silence. In between the shouting, or in the lull between gunfire, hopefully some will notice the quiet and focus on it instead of formulating the counter-argument, or reloading the ammunition. I write this not as a politician, or philosopher, but as a simple artist who is capable of creating something out of nothing. You can call me crazy, unrealistic. I am at home with silence. I therefore call on the world to just pause for a while and be quiet. And listen. Just listen. So much is going on and it is telling us something. The world as we know it now came out of our collective vision and creation. Today, so much of the world is full of senseless violence, hate and cynicism. Let us stand back, stop doing what we’re doing even for a moment, and reflect. Bring on the silence and get our innate senses back. 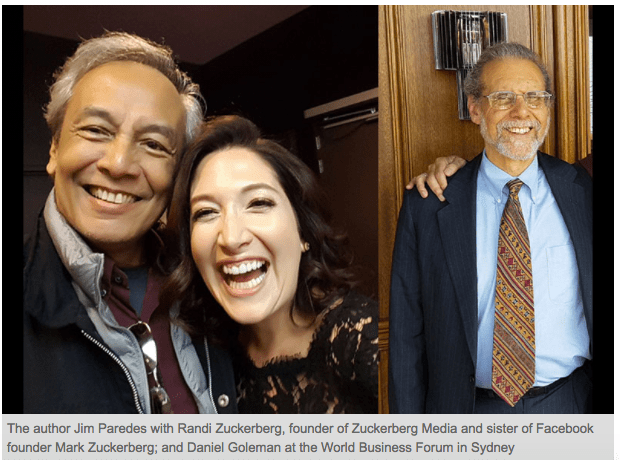 SYDNEY — My good friend, Michelle Baltazar, called to ask if I wanted to attend the World Business Forum in Sydney last week (May 31 to June 1). She said I could apply for a media pass to get in free. The entrance was $AUD2700 per person. I scanned the list of speakers and I knew it was a must-attend affair. I wrote the organizers and managed to get a media pass. The mantra of the conference was intriguing. Everywhere, you could see the phrase, “BE BETA,” which declared that the world, everything and everyone, is in a state of flux. Rather than simply dominating, one must constantly adjust, reinvent, recreate to remain competitive and relevant. It was a full house at the Star Events venue. I listened to every speaker who was a world-renowned expert in his/her own field. Ken Segall, the creative director who had played a major role in Apple’s resurrection after 1997 and who authored the book Insanely Simple, talked about how people will always choose the simpler path. It was the way Steve Jobs thought. His was the mind behind putting the “i” before iPhone, and every winning creation that followed. Mohanbir Sawhney is a scholar and teacher in technology, marketing and new media. He talked about businesses needing to be agile, ambidextrous and collaborative. They must not only be opportunity-focused but also execution-focused, going beyond customer satisfaction to customer delight. The last speaker for Day One was the founder of Huffington Post, Arianna Huffington, who talked via video conference from California. She got everyone to think about redefining success and how power and wealth alone do not define it. She expounded on quality of life for people in businesses, pointing out that people who are happy and healthy are more productive. She narrated an incident where one day she just collapsed from sheer exhaustion, breaking her jaw during the fall. She knew she had to change things. She talked about changing habits by taking micro-steps. She advised everyone to prioritize getting enough sleep, to stop being “on” all the time. A bank in the US actually rewards employees by giving them US$300 if they complete the 28-day challenge of getting enough sleep. They are monitored through their fitbit gadgets which record sleep data, among other things. Day Two started with Daniel Goleman, the world’s authority on emotional intelligence who expounded on the value of a high EQ in running a business. He said that self-awareness is an important state a leader must always be in. “If you are tuned-out of yourself, you can’t manage others.” He further explained that contrary to popular notion, the brain does not multi-task. It turns on and off quickly. He emphasized the importance of human interaction. The brain is designed for face-to-face human meetings and so a leader must go beyond merely sending memos but must actually connect in person. He said emotional intelligence is more important than intellectual capabilities. Ian Williamson, from the Melbourne Business School, talked about adapting, surviving and thriving in an atmosphere of external disruptions. He suggested practical strategies for organizations in times of changes in technology, customer preferences and demographics, competitive actions and new regulations. Awareness of the new ecosystem, motivation and capability to respond to them are key. Jimmy Wales, the founder of Wikipedia, explained how his passion led to the creation of one of the Top 100 websites and how it thrives even without commercial help. He receives no salary. The entries on Wikipedia come from the community. Anyone can edit them. He also talked about threats and opportunities for business in a globally connected world, and how adapting is so crucial to survival. He emphasized the need for synergy with employees, distributors, suppliers and the public. The last speaker in the forum was Randi Zuckerberg, founder of Zuckerberg Media that caters to Fortune 500 companies. Yes, she is the sister of Mark, the founder of Facebook. She recently came out with two books: Dot Com, and a children’s book called Dot which encourages girls to be more interested in technology. The second book is now a TV show in the US. She spoke about her eight years working with Facebook, the lessons she learned there and her contributions to its growth. She was totally engaging with her wit, self-deprecating humor and enthusiasm — she even threw in some singing! Her years on FB taught her that great ideas can come from anyone. And, yes, it is okay to fail, to appear ridiculous. From failure can emerge success. Her idea of adding the FB Live app seemed like a disaster at first. She tried it and only two people watched — her mom and dad, so it was pulled out immediately. But, out of the blue, pop artist Katy Perry called to say she wanted to launch her new album through FB Live. Her co-workers at FB were thrilled. They relaunched the app, and before she knew it, it became a roaring success. Facebook Live is now available to 1.5 billion users. She pointed out how technology has completely engaged practically every aspect of our lives, but she also warned that we must take control of it lest it overwhelms us completely. She ended her talk by indulging in a passion she said she has had since she was three years old, but never got to do in public. She sang Part of My World from the Disney movie The Little Mermaid, changing the lyrics to close her speech.